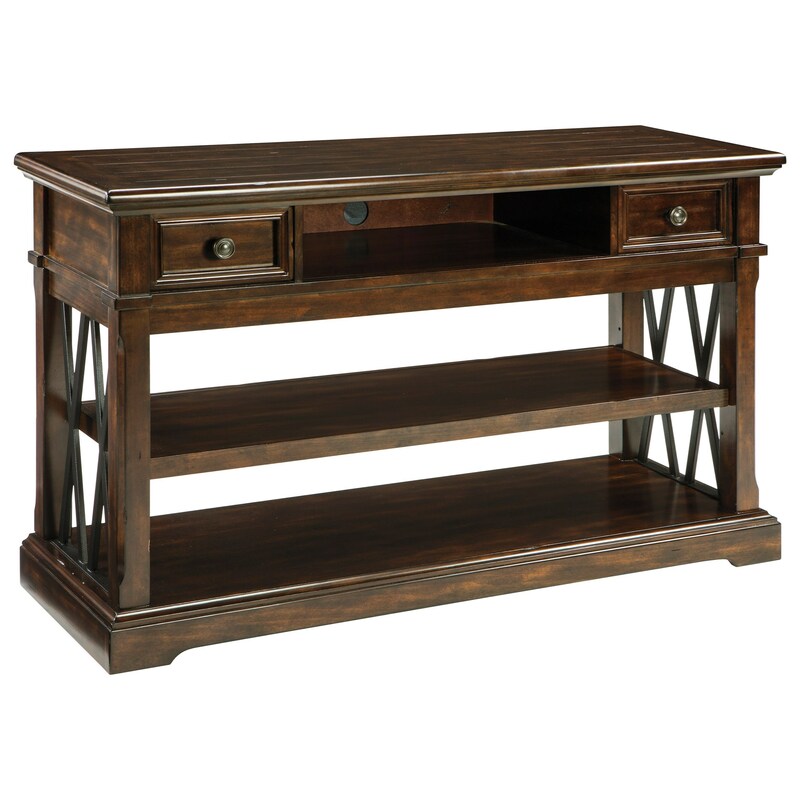 Add smart function and classic style to your living room with this sofa table. The table includes a mix of open and concealed storage space to display decorative pieces and keep other items tucked away. Wire management holes let you easily set up a speaker or media console for modern convenience. A plinth base and framed drawer fronts showcase traditional style, while metal X side panels and wood planks on the table top provide a touch of rustic appeal. The Roddinton Sofa Table with Metal X Panels by Signature Design by Ashley from Nashco Furniture - Nashville. We proudly serve the Nashville, Franklin, Brentwood, Clarksville, Green Hills, Davidson County, Williamson County, Tennessee area. Product availability may vary. Contact us for the most current availability on this product. Wood & Finish Dark, waxy Brown finish. Case Detail X-shape designs, plinth bases. Case Construction Birch veneers over engineered wood and hardwood solids. The Roddinton collection is a great option if you are looking for Traditional furniture in the Nashville, Franklin, Brentwood, Clarksville, Green Hills, Davidson County, Williamson County, Tennessee area.